Imagine you own a million-dollar piece of property free and clear, but then the federal government and local law enforcement agents announce that they are going to take it from you, not compensate you one dime, and then use the money they get from selling your land to pad their budgets—all this even though you have never so much as been accused of a crime, let alone convicted of one. That is the nightmare Russ Caswell and his family faced in Tewksbury, Mass., where the the federal government tried to take the family-operated motel they have owned for two generations. Seeking to circumvent state law and cash in on the profits, the Tewksbury Police Department teamed up with the United States Department of Justice to take and sell the Caswell’s property because a tiny fraction of people staying there during the past 14 years were arrested for drug crimes. Keep in mind, the Caswells themselves have worked closely with law enforcement officials to prevent and report crime on their property. And during those 14 years, the government pointed to a mere fifteen arrests—out of more than 200,000 rooms rented during that time by the Caswells. Despite all this, the Caswells could have lost literally everything they had worked for because of this effort by federal and local law enforcement officials not to pursue justice, but rather to police for profit. The Institute for Justice, a national public interest law firm that fights civil forfeiture abuse nationwide, represented the Caswells in defense of their property and their constitutional rights. After a four-day trial, on January 24, 2013, a federal judge in Boston dismissed the forfeiture action against them ruling that the government engaged in “gross exaggeration” of the evidence and did not have authority to forfeit the property. The judge also held that the Caswells were themselves innocent owners of the property that took all reasonable actions to prevent crime on their property. The U.S. Attorney’s office later announced that it would not appeal Judge Judith Dein’s decision so the Caswells’ victory is now final. The decision is a significant win for property rights, the rule of law, and a hard-working, law-abiding family bullied by the federal government. Will a Trump Administration’s Support for Police Taking Citizens’ Property Trigger Needed Reforms? Civil forfeiture—where the government can take and sell your property without ever charging you with a crime, let alone convicting you of one—is one of the greatest threats to property rights in the nation. To make matters worse, such forfeitures often fund law enforcement officials’ budgets, giving them a direct financial incentive to abuse this power. A prime example of the civil forfeiture abuse is taking place in Tewksbury, Mass., 30 minutes outside of Boston. The Motel Caswell is a family-owned budget motel in Tewksbury. Russell and Pat Caswell have owned and operated the motel for nearly 30 years, since they took over management from Russ’s father in the 1980s. They live next door with Pat’s 91-year-old mother, their son and daughter-in-law, and granddaughter, tending to the business. Having survived for two generations as entrepreneurs, the Caswells have paid off the mortgage on the motel and they expected it to provide a nest egg for retirement. Precisely because it is mortgage-free, the motel has now become an attractive target for taking by federal and local law enforcement officials who seek to cash in on what the Caswells have earned. The U.S. Drug Enforcement Agency (DEA) and the Tewksbury police department are demanding the Caswells forfeit the entire property—worth more than a million dollars— because a tiny fraction of people who have stayed at the Motel Caswell during the past 20 years have been arrested for crimes. Keep in mind, the Caswells themselves have worked closely with law enforcement officials to prevent and report crime on their property. And the arrests the government complains of represent less than .05 percent of the 125,000 rooms the Caswells have rented over that period of time. Indeed, the government’s lawsuit identifies only 19 arrests of guests staying the motel during the past 18 years as the basis of the forfeiture. The government does not allege that the Caswells have done anything illegal. But under civil forfeiture laws, innocent people can lose their property—with no compensation whatsoever—if the government believes it was used to “facilitate a crime.” So unless the Caswells can prove in court that they did everything they could do to prevent crime on their land, the motel—everything they have worked their lives for—will become the government’s property. In short, civil forfeiture treats law abiding citizens worse than criminals, presuming them guilty until they can prove their innocence—a heavy burden for any property owner against the power and resources of the government. Unlike criminal cases, which charge people with wrong doing, a civil forfeiture case is an in rem proceeding (which means literally “against a thing”); the property itself is said to have acted wrongly and is being sued. The idea behind forfeiture was adopted centuries ago in British law to allow customs agents to seize ships and cargo that were in violation of customs laws. Since the owners of the ships were often on another continent, and ownership of the goods and cargo was not clear, it was justified as the only way to enforce the law. Forfeiture is now wrongly used by law enforcement in modern America to take property that police merely suspect of being involved in crime. Under federal law, the property that law enforcement agents take is, incredibly, kept by those same agencies—going straight to the bottom line of their budgets. When local law enforcement agencies team up with the U.S. Department of Justice, the federal government takes the property and pays out up to 80 percent of the money to local or state law enforcement agencies—something it calls “equitable sharing” of forfeiture proceeds. That is what is happening in this case: If the federal government succeeds in the forfeiture of the Caswell’s property, it will send nearly one million dollars to the Tewksbury police department, keeping the rest for itself, and leaving the Caswells with nothing but the loss and destruction of their life’s work. Civil forfeiture creates a perverse incentive for police to target innocent owners and their assets rather than aiming for justice and public safety. No one in the United States should lose their property without being convicted of or even charged with any crime. This case shows that fair and impartial law enforcement cannot exist as long as we allow this policing for profit. That is why the Institute for Justice is joining with the Caswells to defend their rights as innocent owners, and fight the perverse, unconstitutional incentives for law enforcement created by civil forfeiture and equitable sharing agreements. Russ Caswell was a boy when his father built the motel in 1955. For decades, it prospered as reasonably priced overnight accommodations for families on road trips and truckers traveling on the newly built interstate highway system. Annette Funicello and the Mouseketeers stayed there during an early tour. In more recent decades, however, with truckers increasingly sleeping in their rigs and changes to the freeway system, the Caswells have found themselves in a less amiable spot for vacationers. Meanwhile, the Town of Tewksbury has become increasingly subject to gang and drug activity. The Caswells have faced these changes as entrepreneurs and found ways to hang on. Today they provide budget accommodations not only for the travelers that still come to Tewksbury, but to some locals in need of temporary housing. In prior years, the motel has housed families placed there by Catholic Charities and it served as temporary quarters for people facing the distress of eviction or foreclosure. The Caswells have also taken in families on welfare for short periods. The Motel Caswell is a simple, clean, safe place to stay for under $50 a night. Unfortunately, the Caswells have had no better success in escaping crime than anyone else in their neighborhood. It is hard to know what people do behind closed doors, of course, and some people who have stayed at the motel have been involved in drug activity. But the Caswells have not taken this lying down, especially in light of the pride they take in their business and the fact that their family lives right next door. Whenever they become aware of illegal activity, they call the police and cooperate with them fully. The police acknowledge this. In fact, the Caswells have gone above and beyond the law. They have installed security cameras, they photocopy customer’s identification and record their license plates, and they routinely turn that information over to police for their review. Indeed, in nearly 60 years, no one from the town or the police have told them to do more than they have done to reduce crime or that their property might be at risk for failure to do so. As far as the Caswells were aware, they enjoyed a cooperative relationship with authorities. Yet, after years of telling the Caswells nothing, the local police and the federal government now take the position that they should have prevented more crime from occurring on their property. How much crime should the Caswells have prevented? No one knows. The governments’ position is simply that the arrests that have occurred there over the past 18 years are too much. And the penalty is the loss of the property that they have spent nearly their entirely working lives to earn. Of course, the Motel Caswell is not the only property in Tewksbury that has had run ins with crime. According to police logs, the Motel 6, the Fairfield Inn, and even the nearby Wal-Mart and Home Depot parking lots have similar problems. But those properties are corporate-owned, which means the government would have to fight teams of lawyers to take them. And, importantly, the Caswells own their property free and clear, which makes them the perfect target for a government interested in policing for profit: the Caswells are vulnerable and their property is valuable. Civil forfeiture is the governmental power to take property suspected of involvement in crime. Unlike criminal forfeiture, in which the ill-gotten gains of criminal activity may be seized after an individual is convicted of the crime, police and prosecutors can use civil forfeiture to take away cash, cars, homes or other property without having to convict or even charge the owner of any wrongdoing. Although its use is widespread throughout the United States, civil forfeiture is not widely recognized or understood. Because civil forfeiture proceedings are against the property, as if the property somehow acted to assist in the commission of a crime, the government can take it despite the innocence of its owner. That is why civil forfeiture cases have unusual names such as United States v.434 Main Street, Tewskbury, Massachusetts—the case involving the Motel Caswell. Civil forfeiture was originally adopted in America from British law. It may have had its purpose as used in the 19th century as a means for fighting piracy on the high seas or in customs law, where one might never be able to arrest the criminal but could at least take away the ill-gotten gains of criminal activity, but modern civil forfeiture is no longer tied to the practical necessities of enforcing maritime or customs law. Now the forfeiture power applies to a broad range of crimes. Nearly all states and the federal government frequently use civil forfeiture laws. The use of civil forfeiture has expanded dramatically in the modern era since the 1980s as a part of the “war on drugs.” When civil forfeiture is stretched to seize property from people like the Caswells, who have no involvement in the crimes that have been committed by third-parties staying in their motel rooms, it is simply unnecessary and unconscionable. The Caswell’s ownership of their property has nothing whatsoever to do with “ill-gotten gains” from criminal activity. They do not bear any relationship to a pirate or smuggler, incapable of being made to answer to charges brought by the government: the Caswells live on the property and have been there for 30 years. They are eager to cooperate with police and see crime reduced in their neighborhood. Nonetheless, using federal civil forfeiture law, enforcement agencies are able to keep all of the property and currency they take to pad their own budgets. This direct financial incentive was put into federal law in 1985. Prior 1985, federal forfeiture proceeds did not go automatically to the seizing agency but went to the general revenue fund of the United States, where Congress then decided how such revenue would be appropriated to law enforcement or to other government functions. Before 1985, forfeiture revenue was modest. After the profit incentive was put into the law, forfeiture revenue exploded—and it has been growing ever since. In 1986, the year after the U.S. Department of Justice’s Asset Forfeiture Fund was created—the fund that holds the forfeiture proceeds from properties forfeited under federal law and available to be paid out to law enforcement agencies—took in just $93.7 million. Today it holds more than $1.6 billion.1 Though so-called “equitable sharing agreements,” federal law extends this profit incentive to state and local law enforcement agencies. In equitable sharing cases, the DOJ may pay up to 80 percent of the proceeds of forfeiture to state and local law local agencies. When law enforcement agencies grab assets in forfeiture actions, this money may be used for better equipment, nicer offices, newer vehicles, trips to law enforcement conventions and even police salaries, bonuses or overtime pay. Thus, law enforcement agencies benefit in a very direct way from every dollar in assets and currency they manage to seize and forfeit. This profit motive forms the rotten core of forfeiture abuse. The second way civil forfeiture is hard on property owners is by establishing a lower “standard of proof” under which the government can take the property. As most people know, the standard of proof in a criminal proceeding is “guilty beyond a reasonable doubt.” That is, the government must demonstrate to the jury that evidence shows that the accused individual committed the crime beyond a reasonable doubt. This high standard exists to protect the rights of innocent individuals who might be accused of a crime. But innocent property owners enjoy no such protections. In only two states (Nebraska and Wisconsin) does the civil forfeiture standard match the criminal standard—“beyond a reasonable doubt.” Under Massachusetts and federal law, however, the government must only assert “probable cause” to seize property and they can keep it if there is “preponderance of the evidence” that crimes occurred using the property. That standard says nothing, however, about whether the owner is guilty of any wrong doing. Finally, federal law and the law in many states—including Massachusetts—shift the burden of proof from the government to the owner to prove that he or she is innocent of the crime in forfeiture cases. In other words, with civil forfeiture, property owners are effectively guilty until proven innocent. The increased burden (including substantial legal costs) of proving one’s innocence can result in owners abandoning rightful claims to seized property. And if owners do not fight civil forfeiture and the government wins by default, law enforcement agencies are more likely to engage in it. Equitable sharing has led to a massive expansion in the number of civil forfeitures in part because—by pursuing a federal forfeiture—it often allows local law enforcement agencies to receive more money than the agency would receive under state law. As state legislatures have sought to reign in abuse of forfeiture laws by increasing the burden of proof required to seize property, or by prohibiting proceeds of forfeitures from going directly to the budget of the local law enforcement agency, such agencies have increasingly sidestepped state law, entering into the more profitable equitable sharing arrangements with federal law enforcement agencies. This is not just theoretical. As a recent study published in The Journal of Criminal Justice concluded, “When state laws make forfeiture more difficult and less rewarding, agencies are even more apt to turn to the federal government’s easier and more generous forfeiture procedures.”4 Federal equitable sharing policy thereby provides a means and incentive for state and local law enforcement officials to circumvent unfavorable state forfeiture procedures, undermining attempts at reform by citizens and state legislatures. In Massachusetts, the state law recognizes that others might use property in ways that are unlawful and not consented to by the owner. To avoid cases just like the Caswell’s, Massachusetts state law limits the seizure of property to the narrow circumstances in which the property owner “knew or should have known” that it was “used in and for the business of unlawfully manufacturing, dispensing, or distributing controlled substances.”5 To use a motel “in and for the business of” these unlawful purposes is clearly not what has ever happened at the Motel Caswell. State law certainly did not intend for innocent property owners to have their life’s work taken because the occasional low-level drug user or dealer rented a room under false pretenses, using it secretly until such time as the owners discovered and alerted authorities to the illegal activity. By running to the federal government, however, and taking advantage of its more lax standards of proof, equitable sharing allows the Tewksbury police to ignore the policies written into law by the Massachusetts legislature and hold on to a million dollar payout from forfeiture. Unfortunately, in past years, 80 percent of forfeitures occur without the property owner being charged with a crime and federal courts have not yet been clear enough about what an owner is expected to do to avoid having his property seized.6 The Caswells argue they should not have their property seized because they rented a room to someone for lawful purposes only to discover later that the person brought drugs on to the property and engaged in some unlawful activity. 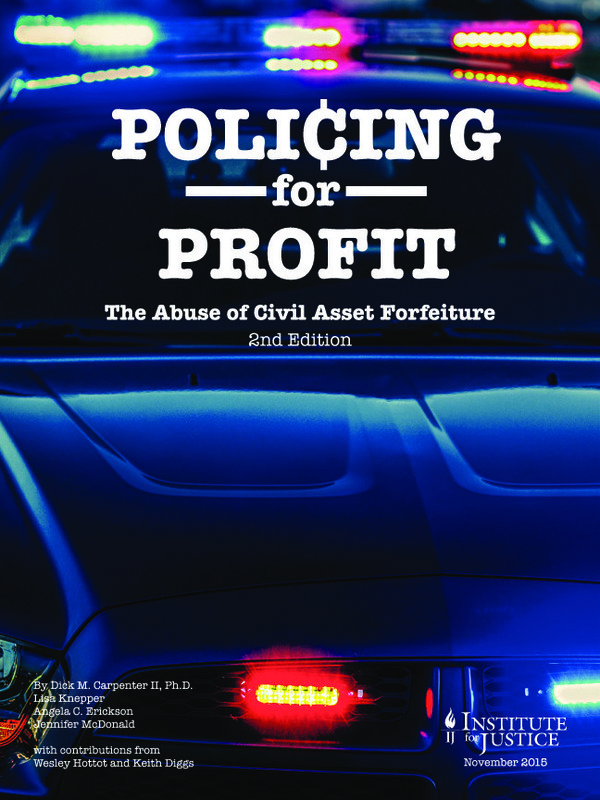 A March 2010 report from the Institute for Justice, Policing for Profit: The Abuse of Civil Forfeiture, shows just how widespread police profit from civil forfeiture has become. At the federal level, civil forfeiture has exploded. As stated previously, the U.S. Department of Justice’s Asset Forfeiture Fund—the fund that holds the forfeiture proceeds from properties forfeited under federal law and available to be paid out to law enforcement agencies—now holds more than $1.6 billion. Payments from the federal government to state law enforcement agencies under equitable sharing agreements have risen to more than $400 million per year. Policing for Profit, as well as numerous academic studies, shows that civil forfeiture is growing in size, has created an incentive for abusing innocent owners, and has warped law enforcement priorities and state policy. In order to limit the rapacious path of this abuse, IJ launched its nationwide civil forfeiture initiative to defend property owners in state and federal court. The Caswell’s case is IJ’s first challenge to federal rather than state forfeiture laws. Van Meter v. Turner—IJ represented Georgia citizens to hold local law enforcement agencies—the Atlanta Police Department, Fulton County Police Department and Fulton County Sheriff—accountable under Georgia’s forfeiture reporting law. Georgia law requires that law enforcement agencies publish a report each year of all forfeitures they conduct and indicate how the money they receive is used. Despite the clear legal requirement to do so, these agencies never made such information public until IJ brought them to state court. State of Texas v. One 2004 Chevrolet Silverado—The State of Texas took the truck of an innocent owner through civil forfeiture and refused to give it back. To right this outrage, and attack various unconstitutional aspects of Texas’ civil forfeiture laws, the Institute for Justice is representing small businessman Zaher El-Ali, a man the state admits had nothing to do with the alleged criminal activity that led to his truck’s seizure. Wells v. City of Riviera Beach— The Institute for Justice successfully defeated an attempt in Riviera Beach, Fla., to abuse its power of eminent domain and displace more than 5,000 residents for a massive private development project that included a yacht marina, luxury condominiums and upscale hotels. City of Norwood v. Horney—In a resounding repudiation of the U.S. Supreme Court’s decision in Kelo v. City of New London, the Ohio Supreme Court unanimously ruled in July 2006 that the city of Norwood acted unconstitutionally in its efforts to abuse eminent domain and take the homes of the Institute for Justice’s clients for a privately owned mall. Kelo v. City of New London—Just three years after the landmark U.S. Supreme Court ruling in Kelo v. City of New London, which allowed private property to be taken for economic development, 43 states have tightened their restrictions on eminent domain. In 2007, IJ client Susette Kelo’s little pink cottage—the home that became a national symbol of the fight against eminent domain abuse—was moved so that it would not be demolished by the government’s wrecking ball. Casino Reinvestment Development Authority v. Banin—In a classic David versus Goliath battle, the Institute for Justice scored a major victory for property rights in July 1998 when the New Jersey Superior Court ruled a state agency could not condemn widow Vera Coking’s home of 37 years through eminent domain and give it to Donald Trump for his private development. The Caswells are defended by Institute for Justice Senior Attorney Scott Bullock, who leads the Institute’s Civil Forfeiture Initiative and litigates property rights and economic liberties cases nationwide, and Attorneys Larry Salzman and Darpana Sheth, who also litigate property rights and economic liberties cases. For a year before IJ got involved, the Caswells were defended ably by George Skogstrom and Tiffany Pawson, from the law firm of Schlossberg, LLC, in Braintree, Mass., who remain on the team as local counsel. Bullock is a co-author of the groundbreaking IJ study of civil forfeiture, Policing for Profit. He argued the landmark U.S. Supreme Court property rights case, Kelo v. City of New London, one of the most controversial and widely discussed Supreme Court decisions in decades. The Institute for Justice is based in Arlington, Va. IJ has state chapters in Arizona, Washington, Minnesota and Texas, as well as a Clinic on Entrepreneurship at the University of Chicago Law School. Ma. Ann. Stat. § 47(d); 21 USC 983(c). J.E. Holcomb, et al., Journal of Criminal Justice 39 (2011), p. 282. Ma. Ann. Stat. 94c §47(c)(3). Hyde, H, Forfeiting Our Property Rights: Is Your Property Safe From Seizure? p.6, Washington, D.C. (1995): Cato Institute .